Inspired by all the chatter lately on the Moscow Mule, I decided to do my own version, only I left the cold of Russia and sauntered down to sunny Mexico with a tequila version. I really don't get the fascination with a Moscow Mule, it's not a bad drink if you like ginger beer because, vodka being pretty neutral, that's pretty much what you'll taste along with the small part of lime. Toxic copper mugs aside, it's high octane ginger beer with a squeeze of lime and I don't really like ginger beer. Add to that the fact that the Moscow Mule was created solely as a marketing ploy to sell vodka and ginger beer, and kind of I lose interest. But, with all the hooplah about it lately in the booze community I thought I'd have a go at it to suit myself and my desert environment. So, the first thing I did was remove the ginger beer and vodka and replace it with ginger ale and tequila. Bye bye, Moscow Mule. 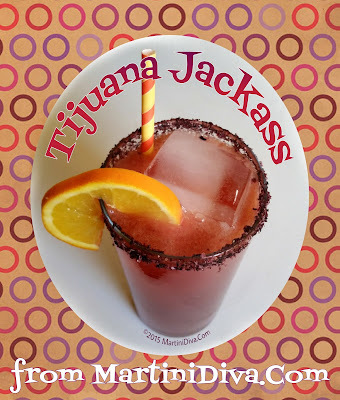 Hello, Tijuana Jackass! Rub glass rim with citrus, dip in the hibiscus salt flakes, chill your glass in the freezer. Hand squeeze the watermelon juice. Yes, you can use a juicer. Add the ingredients, except the ginger ale, to an iced filled cocktail shaker, shake until icy cold then strain into the chilled glass. Top off with ginger ale, stir, add a straw if desired.